Banff is at its busiest in the summer months, but it is equally as beautiful in winter. Snow capped mountains, a beautiful winter wonderland, and a plethora of winter sports to keep you busy. Visiting in the winter can be more economical and a totally different experience then visiting in the summer. If you are an outdoor enthusiast or merely want to observe the mountains from inside your cozy hotel, Banff in winter makes a great destination. Have you already read our complete guide to visiting Banff and the Canadian Rockies in the summer? My brother lives in the Bow Valley and we are fortunate to visit the area frequently. We want to share with you our favourite things to do in Banff in the winter and where to stay and eat. This guide incorporates lots of local information from a resident as well as our experience in visiting the area. Since we travel with kids, we also give tips relevant for families visiting the area. 6.0.1 Enjoyed Reading this Post? SIGN UP for more. The Canadian Rockies offer world-class skiing with loads of fresh powder and terrain for all abilities. Skiing in the Banff area is unique because you are skiing in a National Park, giving you a pristine wilderness experience. Our favourite ski resort is Lake Louise (45 minutes from Banff) because it offers great snow, terrain, and an excellent ski school. Other popular ski resorts in the area include Sunshine and Norquay. If you can’t pick just one mountain to explore, you can ski all 3 through the Ski Big 3 Pass. You can read about each of the mountains and what they have to offer in this informative article. Lake Louise is located in Banff National Park and is our favorite. If you are staying in Canmore or Banff, you will have a 45-60 minute drive each day to get to the ski resort, but it is well worth it. If you are an experienced or beginner skiier, this is a not-to-miss activity in Banff in winter. With Kids: All of the ski resorts offer great learn to ski programs for kids. In just five days on the slopes at Lake Louise, our kids became much more confident and comfortable skiers. We got to ski with our kids first thing in the morning and later in the afternoon and enjoyed touring around on our own in the middle of the day. The kids loved spending time with their instructors and other kids their age. Our youngest attended the resort daycare where he also went out for 2 1 hour ski lessons each day. If cross country skiing is more your thing, there are lots of trails in Banff, Lake Louise and Canmore. Check out this link for more information. This lake gets lots of attention in summer, but it is equally as spectacular in winter. 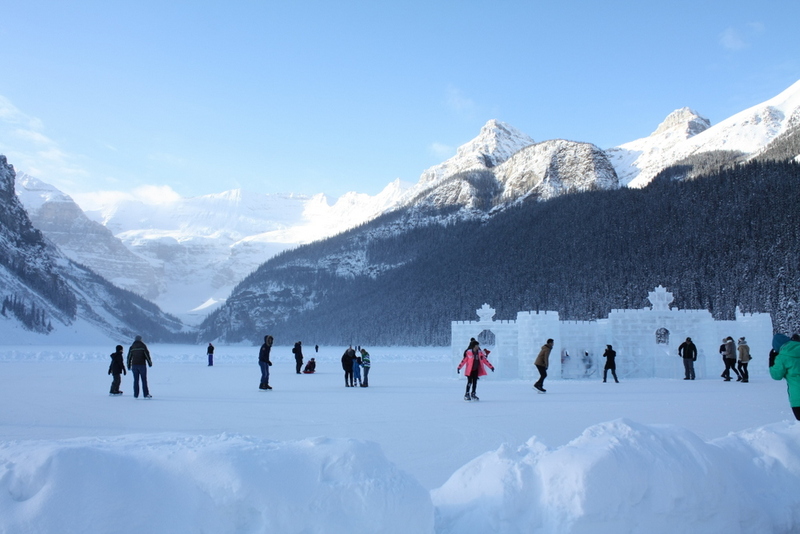 Just 30 minutes from Banff, a frozen ice castle is built on the lake each year. You can view the majestic lake and ice castle from inside the hotel’s restaurants or even from your hotel room. Rent ice skates from the Chateau Lake Louise rental shop and you can skate around the lake and through the ice castle. There is nothing more Canadian then skating on a frozen lake! Afterwards warm up inside the Chateau Lake Louise with a hot beverage. With kids: our kids love the Lake Louise ice castle. The Chateau Lake Louise rental shop has kid size skates. This is another great family friendly activity. They will really appreciate the hot chocolate afterwards! One year my brother gave this to our family for a Christmas present. We love giving and receiving experiential gifts and this classic Canadian experience was amazing. We learned about these amazing huskies and their love for running and we even got to drive our own sleds. 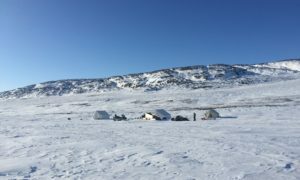 We did our dog sledding tour through Snowy Owl Sled Dog Tours in Canmore, which was a first class operation. Dress really warmly because it is cold out there in the forest. We dog sledded through the woods, across frozen lakes and ended the day with hot chocolate and snacks beside a warming bonfire. 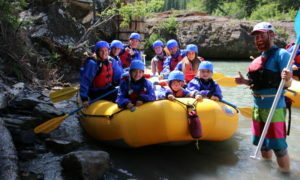 With Kids: our kids loved this experience! The younger ones loved being cuddled into the sled and the older ones loved the opportunity to learn to drive the sled and dog team. Even if you aren’t staying at one of these beautiful hotels from a bygone era, it doesn’t mean you can’t enjoy them. Walking through the Fairmont Banff Springs Hotel is a must when in Banff. This hotel was built in 1888 along the Bow River and is in walking distance to the town. During the Christmas season they are both festively decorated and at their best. There are gingerbread creations, Christmas lights and trees galore and a cozy, festive feel. Walk through the Heritage Hall and see photographs of the hotel when it opened and read more about the history of the hotel. There are lots of lovely restaurants to have lunch and get your fill of this classic hotel. The Fairmont Chateau Lake Louise is also a classic heritage hotel. You can’t beat the location of the Chateau and it is definitely worth wandering through the hotel when at Lake Louise. Touring the heritage hotels is a must! WITH KIDS: Our kids find the history of these hotels really interesting, especially if it involves a lavish buffet breakfast or high tea after looking around. I know it can be quite hard to step outside a cozy hotel into the chilling white of winter for a winter activity. But once you step outside into the fresh, crisp air and look out at the mountains, you will be glad you did. Snowshoeing allows you to walk on the deep snow and the modern versions of these devices are not nearly as hard to walk in as their traditional relatives. Depending on your experience, you can snowshoe as part of a tour, independently just outside of town or head farther out for a back country experience. Click here to get some ideas of area routes from Parks Canada. You can rent snowshoes in Banff or Canmore and this is a great way to get active for all ages. With Kids: kids’ size snowshoes are available and some of our kids found it more difficult then others, but it is such a great activity to do together as a family. Maybe you aren’t a skiier, but you still want to get to the top of one of the mountains in the Rockies. Luckily, the Banff Gondola at Sulphur Mountain has recently undergone an extensive refurbishment and is a great thing to do in the Canadian Rockies. The panoramic views from the top are the same, but the dining options have been taken up a level. Brewster Canada runs this attraction along with many other activities in the area. This mountaintop experience takes you 2900 feet above Banff for incredible views of the Canadian Rockies. The Sky Bistro offers up top notch food with those spectacular views and is definitely worth a splurge. It is often closed for a few weeks in January for annual maintenance, so check before you head out. Gondola tickets are $56/adult, $28/child (6-15) and free for kids under 6 when purchased in advance. WITH KIDS: our kids loved the views from the top and of course taking a gondola is always a hit with the kids. Just because it is winter, doesn’t mean you cannot hike. One of our favourite things to do in the winter is hike up Johnson Canyon, which is 25 km from Banff. You can rent ice picks in Banff or Canmore, which are definitely needed on the snow covered walk up through the canyon (2.7 km to the Upper Falls). It isn’t a hard walk, but does require good mobility. Often you can see ice climbers at the falls. With Kids: we did this activity without kids, but I think it is definitely do-able with kids over 6 years old. We always manage to see some wildlife while we are in Banff National Park, but don’t expect to see all the quintessential Canadian animals in one trip. I have only ever seen one moose in my whole life (and that was in nearby Kananaskis country in the summer). Elk, big horn sheep, and deer are common sights in Banff in winter. You may see a coyote or mountain goat if you are lucky. WITH KIDS: kids will love looking out for wildlife as you drive and walk around the area and this is one of the most popular things to do in Banff National Park. 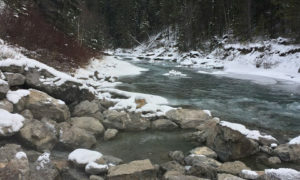 The Canadian Rockies offers up lots of natural hot springs that locals and visitors have been enjoying since the 1800s. I love the hot springs in the winter the best. The Banff Upper Hot Springs are 100% fed from the spring and is a great low cost activity (entrance is $7.30/adult, $6.30/child and $22.50/family (2+2)). The indigenous people have used the hot springs as a sacred place before they were discovered by Europeans and developed. You can read more about the history and see photos of the Springs over the years. Be warned that the springs look more like a pool then a natural hot springs, but are still very enjoyable. There are also hot springs run by the National Parks at Radium and Miette (only open in the summer). If you want a completely undeveloped hot springs, check out Lussier Hot Springs, a 3 hour drive into British Columbia. WITH KIDS: the temperature of the hot springs varies by season, however, our kids love going. Just make sure to have them pop out for a few minutes once in awhile to cool their core temperature down. With Kids: this is a great family activity for kids of all ages. Kids will love sleigh riding like Santa and this unique way of moving around. Canada truly is a winter-activity wonderland and there are so many things to do in Canada in winter. Staying in Banff National Park is an amazing way to experience the Rocky Mountains and allows you to easily explore the region. Here is our list of the best hotels in Banff. You can get some great deals in the winter months and for even better value, consider staying nearby in Canmore, a 30 minute drive away, with a wide range of accommodation. Click here to check the latest prices of accommodation in Canmore. These places to stay in Banff all provide cozy, mountain styled accommodation with great views of the Rockies. If you are looking for fine dining, the best coffee or delicious pub fare, we have you covered. Here is our list of the best places to eat in Banff. Have you tried honey with your pizza? So good! Sky Bistro – this newly refurbished and redesigned restaurant on the top of Sulphur Mountain is accessed by the Banff Gondola. In addition to having the best views in Banff, this restaurant serves up delicious bistro food. Banff Avenue is the main street in Banff and there can’t be a more picturesque place to shop. While there are buses and shuttle service available between Banff and many of these sites and experiences, it is easier if you have your own car. If you are comfortable driving in winter conditions, you can easily pick up a rental car in Calgary. You definitely want to pay the surcharge to have winter tires on your rental. We have had great success booking cars with Expedia. Check their latest prices here. December until the end of March is the best time to visit Banff if you want to participate in winter and snow activities. Visiting during the Christmas season is lovely because all of the hotels are decorated and you certainly get that white Christmas experience. The two weeks over Christmas and New Years are high season and will be more crowded and more expensive. Travelling in January and February will ensure good snow and better prices. The Canadian Rockies and Banff in winter can have very low winter temperatures and you need to make sure you are prepared for the elements especially when participating in outdoor activities. Make sure you are dressed appropriately as frostbite is a real risk. Consult the National Park websites before setting out on trails as there may be avalanche danger in the area. Always travel in groups and make sure you are prepared with adequate water, food and communication devices. You can read about our last trip to the Rockies in the winter in this post. We hope this post has given you lots of ideas about what to do in Banff in winter. Every time I see Banff Dawn I am stunned by the beauty of the place. It looks like a postcard, or, out of the movies. Like it was engineered as the ultimate winter paradise. Dog sledding would be A1 on my list, no doubt. So much fun working with this guys which love to pull. My parents have a small American Eskimo and that guy is a load to handle when it gets cold and snowy because he is in work mode. Fun to imagine how these brutes would be in such a stimulating environment. Fab post! Dog sledding was definitely a magical experience. It is so interesting to see how much the dogs want to run and work…they are beautiful animals. I had no idea there was this much to see & do during the winter time in Banff. This place has always been on our bucket list. I now think our only problem would be deciding if we should visit in the summer or winter! 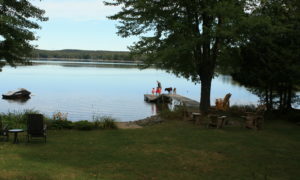 There really is so much to do in either season Sharee, and each offers a totally different experience. I am sure you guys would love either, but winter would probably be the most unique for you.